On Fridays, I’m God. I wear nothing and I glide about my living room and I hold my heart in my open palm and see that soft flesh glow red and ghastly before me. These are sweet kind things, my insides. Most days of the week I am just me, but this one day I am this other thing and this is special. It is so special that I wonder if others get it too, or if I am the only one who is truly weekly born again. For this is the feeling I get. It is a right now, right now. Each fiber of my five-foot-seven being standing on end as I electrify my abode with my rays of knowledge. I say, Wall. I say, Hello, Wall. Have you always been this yellow and fine always? And Wall says back to me, You painted me! You painted me, sir! And I say, Well such a thing as that I do not remember doing. But it is necessary that each and every life be filled with fine but un-rememberable acts. And Wall agrees and I slap his plaster good. And I see Chair and I say, Chair! Fine thing that you are on the ground with your legs and way of holding me or not holding me when the moment comes or goes. And Chair says, it is in my infinite pleasure to be at your service my kind and benevolent leader. And I say, Chair, I say, You know how it is to make God feel like he has done right on this earth. And so it is with Plant and Spoon and Harp and Armoire and in this way I go about greeting the subjects of my one-room apartment, with its hardwood floors and its windows that show trees and sky and bits of another world, much bigger and wider than my own small kingdom of heaven. On Thursdays and the other days when I am not God it can be a hard place to be, this apartment of mine. On the windowsill, I watch the gauze-white of the curtain as it blows up and forth, and I look to see if the girl with whom I am in love has placed her hand there to pull it closed. But then I am standing in a pool of sunlight on a small white rug and this is just a memory and I have woken into a day that is not the day I believed it to be. I close my eyes and touch the soft moments of the past. I hold the chin of each girl I have ever loved in the palm of my hand and see the halos that the dance hall lights have made on their hair, oh so glinting glinting. For you see, when I am not God, I am a thick pile of immovable man glued to a space and time that is old like my grandfather’s skin. I am a dredger-up and wader-through of memories. They pile thick around my ankles and wrinkle and warp the skin that I am living in and hurt just as they feel so good, this oh so much that I have lived before the life that I live now. When I am not God, I look at my name on the wall where it is written in my own hand. I say Hank. I say the letters out loud, H A N K and I see it and it is me and it is not me all at once. Fibers, sinews. Today, tomorrow. I have been this person for this many years and my name is not me as I am like plant or hammer or constellation. I am a thing called a thing by a namer, and it is only when I am God and I am the one doing the naming that I can float up high and know the rightness of what I say. Sometimes, when I am God, I go to the bodega and buy orange soda and individually wrapped pieces of bubble gum. The blocks that get me to the store are hot and long and full of a repeated earth that I singe into my brain as best I can. It is a repeated earth full of dying moments. I am a dying thing, as we are all dying things. I want to tell the girl I love who is not here, to hold me, for I am the bones of a soon to be ghost as she is the specter of the things that I have done to her. We used to dance without music. It was a slow, cool thing. I did not need to be God when I knew her because there was a thing inside me that kaleidoscoped all things, all colors, all words. I do not know what is better: to be God or still be loved by her. My girl had a head crowned with soft and amber braids that I held in my hands and pressed my face against, and sometimes at night I could forget we were the two things and think we were the one. In mirrors, I remember I am a thing and a person and a Hank, and it is a funny thing to have happen and I want to grab the arm of anyone else, but most times I am alone. When I am not God, I ask God what it is to have a jaw and what it means to hold it, and I think about my insides as a thing I own like a couch or a chair or a yellow wall lit with his light. But he doesn’t answer because he is a busier God than I. On most days she would pull back the white gauze of the curtains and start our life together, and I would watch it happen not believing that as light entered the room she was a real thing with teeth and hair and knee bones that bent when she ran in the dusk from my angry and wild calls. The browns of her eyes like a cow pasture pond spoiled by constant thirst and I the spoiler, greedily and hungrily knowing and not knowing as much of her as I could. After we made love in the mornings, I would fly along the ceiling and leave her in the bed, my cigarette smoke an engine trail of my finished pleasure. And all of the things we owned together would smile her way and say, Miss Miss, he does love you so, we know and we swear. Only it is not till now that I can hear their words and see the smiles of the Clock, of the Oven, of the Television Set. They speak to me now of what I would not hear then. God, they say, What have you done? Look how your ways have lost you your spoils. I sometimes ask myself how it is I came to be God on Fridays or whether I have always been this way and just not known. When I am not God and I am Hank, things are not so clear and I see sights when I close my eyes of my fists in the air and lightning storms and her soft white breasts and my ugly laughing face and palm trees and me and her together but both alone and I don’t know if I ever truly was or will be God again. And then comes Friday and I awake with a pain and a love and a quiet and again I just don’t know. When I was a good thing and she was a new thing and we danced slow and careful together and drank red juice and ate cheeseburgers and held each others’ wet, new skin tightly, it was a good kind world and I did not then wonder about the color and shape of my insides. I did not know the names and voices of the subjects of my kingdom, nor that I was a ruler in the making, only that I was alive and it was a thing that I did and did okay. I wonder if the Friday part of me will take over slowly for the rest of the week or whether this is the way it will be till I am not a live thing. It is a thing I cannot know, but still I wonder. Sometimes I ask myself if this is how she felt, toward the end, when I was no longer kind and she was all days of the week another subject in my kingdom. I want to ask, but she is gone, a white moon fading from the end of my finger, a thing once mine, now lost, but existing just the same. 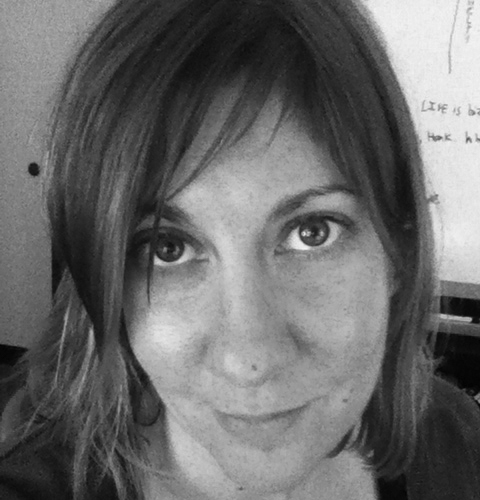 Rebecca Bernard holds an MFA from Vanderbilt where she served as a fiction and music editor for the Nashville Review. Her work appears in places such as The Journal, Epiphany, and McSweeney’s Internet Tendency. She currently lives and teaches in Louisville, KY. “The Maw of My Heart” is the title excerpt from a novel in progress.